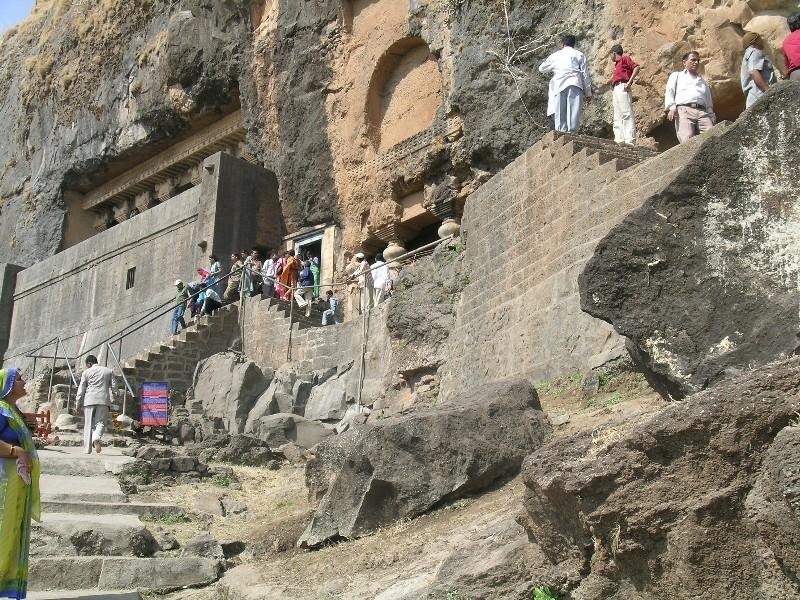 Atop a mountain in the eighth of the Buddhist caves resides the Girijatmaj Vinayak.These caves are also known as Ganesh Gufa.The temple is Dakshinabhimukh- facing south and has been carved out on one single rock. The sabhamandap of the temple is 53 feet long and high, but does not have a single pillar to support it. The Sabhamandap has within it 18 Overee[small rooms for meditation] in one of these is the idol of Girijatmaj.The idol itself is uttarabhimukh that is facing north. The idol here is not a statue but a fresco carved out into a rock. The head of the idol is turned to the left. With a desire of having Vinayak as her son, Parvati performed penance for 12 years in the caves of Lenyadri. Ganapati was pleased and gave her the boon she wanted . On one Bhadrapada Shudh Chaturthi, Parvati scrapped the scraf from her body, mixed it with oil and ointment and formed an idol of Ganesh. She was performing pooja of that idol, suddenly the idol became alive and told Parvati that as desired by her he has taken Avatar in her house. On 11th day he was named Ganesh meaning a person who keeps three qualities Satva, Raja and Tama under control. Lord Shiv Shankar gave him boon that whosoever remembers Ganesh before starting a work, will successfully complete the work. Ganesh grew up for 15 years at Lenyadri. Demon king Sindhu who knew that his death is in the hands of Ganesh, sent demons like Krur, Balasur, Vyomasur, Kshemma, Kushal etc. to kill Ganesh on Lenyadri. Instead Ganesh killed all these demons in his childhood. Ganapati also performed many Balleelas in this place. Hence Lenyadri is considered holy place .At the age of six, Vishwakarma worshipped Ganesh and endowes him with Paasa (noose), Parasu (axe), Ankush (hook) and Kamal (Lotus). Parvati's second name is Girija, her Aatmaj means son Ganesh is therefore called as Girijatmaj. Out of 18 Buddhist caves on mountain, Girijatmaj Vinayak's temple is in the eighth cave. These caves are also called Ganesh caves. The entire temple is carved out of single stone and is facing south. In front of the main mandir, there is a huge Sabhamandap (Hall) which is nearly 18 meters long and about 17 meters broad and, surprisingly, there is no any single pillar in that Sabhamandap. It has 18 small meditation rooms. Shri Girijatmaja's abode is the central one. The sabhamandap, about 2 meters high, has six stone pillars decorated with cow, elephant, etc. carvings. Lenyadri is exciting place to visit for the people who love trekking and also it is a holy place.. Excellent sculpture surrounded by fabulous carving on rocks.Lenyadri is 96 kms away from Pune. 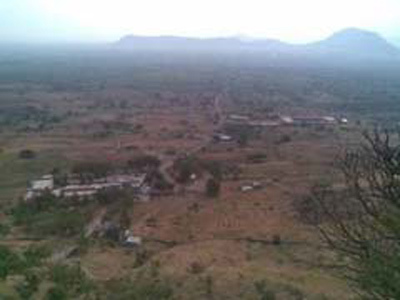 It is situtated at a distance of 6 km from Zunnar taluka. And another most exciting thing is that we can also see Shivniri i.e the birth place of Shivaji Maharaj which is very near to Lenyadri. Lenyadri is also known as Shri Girijatmaka. Shri Girijatmaka situated on a hill on the banks of Kukdi river at Lenyadri.There are 283 stairs to climb to reach the temple. 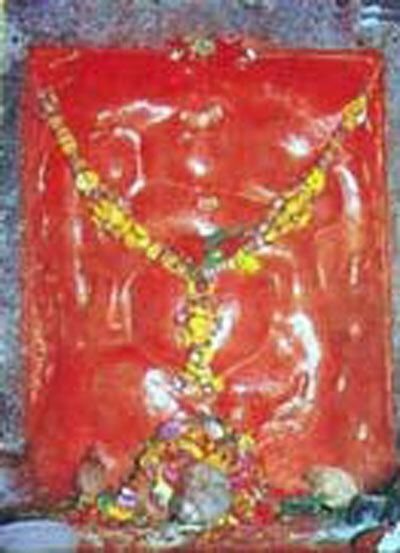 The idol is believed to be "Swayambhu" as was found or not sculpted by human hands. Ganpati'sread ceremony was performed here. Kamar Ali Darvesh Dargah is a highly honored mosque located at the small village of Khed Sivapur, about 25 km south of Pune. Hazrat Kamar Ali Darvesh was a saint who was known to help poor people. He came from the north and chose to settle in Khed Shivapur more than 800 years ago. After his death, this Dargah was built on his tomb and has been known to possess miraculous powers ever since. A large number of devotees come here daily to offer flowers at the Dargah. Every year, a grand fair is held here with much merriment. Urs festival is also held here annually. Pune Junction Railway Station is 25 km from here. Pune Lohegaon Airport is the nearest airport. Dashmesh Darbar is located in Pune and was built in 1950. It is associated with Guru Gobind Singh. Guru Nanak Jayanthi, Baisakhi and Guru Gobind Singh Jayanthi are the three important days observed in the Gurdwara. Har sunday ko guru ka langar banaya jata hai jise har verg ke log bina bedbav ek pangat (line) me baith kar khate hain.Har Roj nitnem se gurbani ki kathha aur Kirtan Hota hai. guru Granthh Sahib kalyug mein manvata Ke bhalai ke liye hi avtar liye hain. Ganesh Peth Gurdwara is commonly known as Gurusingh Sabha. It is considered to be the first Gurdwara in Pune city. It opens early in the morning with prayers. A community lunch is served on all Sundays, after the morning sessions. The main festival celebrated here is the birth anniversaries of the first guru, Guru Nanak and tenth guru, Guru Govindsingh. The Khandoba temple can be divided into two parts, the Mandap and Gabhara. The idol of Khandoba enshrined in Jejuri temple speaks volumes about the talent of its craftsmen. The weapons situated inside the temple namely a sword a damaru and a paral, have historical importance attached to them. The temple also serves as a venue of Sword Competition held every year on Dasera Day. Jejuri town is also important from historical point of view. It was here that Shivaji meet his father Sahaji, after a long period of time and discussed the strategy to be followed against the Mughals.. The Shrimant Dagdusheth Halwai Sarvajanik Ganpati Trust, based in Pune was established in the year 1893 and has thus been in the service of devotees since 108 years. It was in 1893 when Lokmanya Balgangadhar Tilak gave a public form to the celebration of the festival of Ganpati and made it a genuinely people's festival. The Shrimant Dagdusheth Halwai Sarvajanik Ganpati trust exists from the year of the inception of the sarvajanik (public) Ganpati festival and is the fulcrum of all sarvajanik(public) celebrations in Maharashtra. Road Transport:Excellent road network connects Mumbai and Pune. State-run as well as private buses operate on a frequent basis between the two cities. It is one of the most important museums of the city and is housed in a Rajasthani building located on the Bajirao Road. It houses a wide range of fascinating Indian arts and crafts apart from a large number of other interesting artifacts. The museum is divided into 36 sections that include carved palace and temple doors, exquisite pottery works, traditional Indian lamps and paintings belonging to 17th century. This museum houses interesting artifacts that were excavated from the Sahyadri and Gondhwa regions of Maharashtra. The archaeologists will surely find this museum an amazing one. This impressive palace was constructed by the Peshwas in the year 1736. The imposing brass studded gates and lotus pools are the only major attractions left in this palace as it was destroyed by a huge fire in the year 1827. This palace is counted among the major tourist attractions in Pune and it is now recognized as symbol of Pune culture. Don’t miss out the 'Light & Sound Show' which is held here every evening. This palace is an important highlight of this town and flaunts beautiful arches, gracious building having salons, suites and spacious lawns. The palace holds a lot of historical importance since during the 1942 Quit India Movement, Mahatma Gandhi and his wife Kasturba Gandhi were placed under house arrest by the British in this building. You must not miss this palace when you travel to Pune. It is a splendid temple built by Balaji Baji Rao and occupies a significant place for the pilgrim tourists. You have to climb 108 steep and narrow steps in order to reach the hill top temple. Formerly it was the private shrine of the Peshwas. It also houses Parvati museum featuring portraits of Peshwas, ancient manuscripts and coins. From the top of the temple you can get the awe-inspiring views of the town. This is one of the most popular tourist attractions in Pune and is also known as Mahatma Gandhi Udhayan. It is located on the right bank of the Mula-Mutha Rivers and was built by Sir Jamshedji Jeejeebhoy to provide the poor with water during hot months of the summers. The adventure enthusiasts can indulge here in boat rides and horse rides. 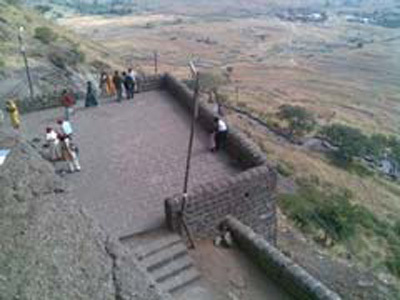 Touristplacesinindia.com offers online information on the Pune Tourist Attractions and also offers useful inputs about Pune.